Last time we talked about a trick called the splitting line technique where we could make a countermelody more interesting by breaking it up between two different melodic lines. This time I am going to discuss what theme and variation are and how this is used. Theme and variation lets you take a single melody or a part of that and use it as the basis for similar musical ideas. This allows you to work with a single melody throughout your piece, but make it more interesting on a consistent basis than you would with simple repetition. There are many kinds of variations you can use but today we will only use the first two, called sequence and inversion. Lets start off with Sequence. This is where the original theme is replayed starting on a different pitch. There are two kind of sequences, an exact sequence and an inexact sequence. So as you can see in the second example I transposed the original theme a minor second down. That means I used the exact intervals of the original theme while starting on a different pitch. In bars 5 and 6, this is my own choice, I repeat the original theme and in the last two I use a new second motif. 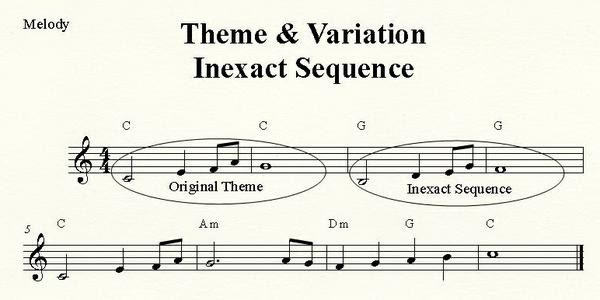 In the inexact sequence example above diatonic intervals are used instead of exact intervals. Diatonic means that the transposed notes are still within in the same key, in this case C major (so no sharps or flats). Start experimenting with a two bar melody, original theme, and then incorporating an exact sequence and/or and inexact sequence. Remember that you can go up or down from the original theme, that depends on you.